Bubbles make me smile. I enjoy blowing them every now and then. I like to see how big I can make them before they pop. It’s neat to see how far those bubbles that stay intact can fly before the environment absorbs them and they succumb. Sometimes, rather than see how far they can fly, I’ll chase the bubbles down and pop them myself. And speaking of popping bubbles, who doesn’t love popping the bubble wrap after it has served its purpose? From the outside, bubbles are easy to see. There is a little shimmer that identifies the boundary separating them from the rest of the world. As unique as each bubble is, we can clearly identify the perimeter. But I would imagine it’s much more difficult to see how big or small the bubble is if we were on the inside. 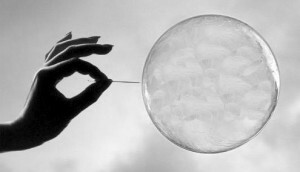 Truth is we don’t have to imagine a bubble from the inside for we all live in one. Each of us lives in our own version of the world, confined to the thoughts we have been exposed to, the people we have let into our lives, the ideas that have been introduced to us, and the experiences we have accumulated intentionally or otherwise. We are often quick to identify others who are living in their protective bubble, but we rarely consider the shape and size of ours. Heck, I bet many would argue the fact that they live in a bubble. And many who might acknowledge that they do in fact live in one are likely to tell us that it’s comfortable in there and they have no desire of either making it bigger or popping it all together. I’m not one to burst anyone’s bubble, but just like a kid at a birthday party, I do enjoy popping them. And I know I am far from alone. At the end of a retirement ceremony last week, I believe I witnessed a valued Shipmate pop his own bubble. This Shipmate played a significant role in the ceremony doing something he had never done before, in a rather courageous way, I might add. When I congratulated him on his performance, he simply looked at me, smiled, and stated the phrase I had previously shared him, “Get comfortable being uncomfortable, right Sir! ?” If I’m not mistaken, I think I heard a loud popping sound as he finished. A bubble constrains our thoughts, as we surround ourselves with those who tell us what we want to hear. A bubble constrains our growth, as we refuse to seek out new experiences and adventures. A bubble constrains our ability to connect, as we miss opportunities to meet new people with different backgrounds and ways of life. We come into this world in a very small bubble. We are issued a family, a language, a faith, a nationality, and a way of life. None of that is a personal choice, each of it is a choice made for us by others. Some of us are happy in our bubble and have no intention of living beyond it. Many of us are happy in our bubble yet want to experience life outside it, so that we live a life of deliberate choice as opposed to blind followership. Life in our bubble, by definition, is comfortable. But a life confined by our current comfort zone sells this journey short. We may venture outside our bubble, decide to come back, and that’s OK. We are making our bubble bigger and choosing to return to its core. It’s a choice. We may venture outside our bubble and never come back. We may venture outside our bubble and inspire others to follow our lead. Life is an adventure and people are amazing. Don’t limit your life to a small bubble, make it as big as you can. Pop the darn thing! Inspire others to pop theirs…Explore together! I love and appreciate the bubble in which I grew up and looking back at it, it’s amazing to me to see how small it really was. I’m amazed by the things I have experienced and the people I have met by being encouraged at an early age to explore, to see life through the eyes of others, and to learn to get comfortable being uncomfortable. Fortunately for me, I found a partner who creates opportunity and holds me accountable on a regular basis for doing just that. Do you see the dimensions of your bubble? Will you be OK living the rest of your life within it? How might you pop yours and help others to do the same?